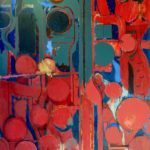 Formed as an artist in the crucible of American industrialism, Arthur Osver journeyed into realms of abstraction to find a unique way of seeing and painting. In Bernard Malamud’s 1969 comic novel, Pictures of Fidelman, Bronx-born painter and aspiring writer Arthur Fidelman travels to Italy to continue researching his life’s work—a fresh critical perspective on Giotto—and reinvigorate his painting practice. From the moment he arrives he is beset by a series of particularly Italian calamities including con games and desperate romantic entanglements. Along the way, his manuscript is stolen, his painting gains new life, and he questions just about every long-held belief regarding decency and sanity that a person possibly could. Fidelman’s agony makes for great comedy, but there is something achingly true about his radical shift in perspective. In a far less salacious manner, the modern American painter Arthur Osver (1912–2006) underwent a similar fate. In 1952 Osver, whose paintings consisted mainly of moody industrial cityscapes, won the Prix de Rome and traveled to Italy to continue his work. For Osver, whose paintings seemed to hinge on a deep familiarity with and immersion in his chosen subject—the secret life of American industrial forms—the trip resulted in a crisis. As with Fidelman, however, not every crisis leads only to tragedy; in Osver’s case, it led to a new way of painting. In the new book Arthur Osver: Urban Landscape, Abstraction, and the Mystique of Place, edited by Angela Miller and just published by the Kemper Museum of Washington University in St. Louis, this break provides a line of demarcation that helps structure the story of Osver’s life on canvas. The book, which is the first to cover Osver’s 75-year career in full, comprises two essays, one focusing on the artist’s earlier works in the urban landscape mode and one detailing the abstraction and material experimentation that followed. These texts, coupled with a wealth of beautiful reproductions and a lengthy interview with Osver, provide a much-needed resource on the artist. 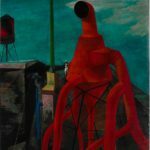 The Chicago-born painter’s early works contained a touch of the surreal, and his strange landscapes drew comparisons with the psychologically potent proto-Surrealist work of Giorgio de Chirico. These tendencies mixed with his knack for capturing and synthesizing what he had seen, as powerfully exemplified in the 1945 oil on on masonite painting Red Ventilator. The central focus of the image is the machine, which stands like a prehistoric beast with neck and legs stretched unnaturally long. The open pipe which serves as the ventilator-beast’s face is a simple black oval. The sky behind the central figure is aqua blue, adding to the dreamy unreality of the image. At the heart of the painting, though, is a mundane vision of modern terror, not in the social or political sense but through a subjectively human frame. The magical-realist tendency in Osver’s work of this period captures something urbanites regularly take for granted—that we are surrounded by monsters. Here, in a flash of atavistic fright, Osver finds an effective place where the mind and the external world can meet on canvas in the expression of psychological truth. 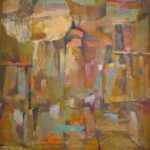 Perception was key for Osver, and despite his move toward abstraction, he was dubious of dispensing completely with visual referents and critical, at a point, of his abstract expressionist contemporaries. Even when not painting figuratively, his images were composites of things he had seen. This was particularly true of his time spent in Long Island City. After graduating from the Art Institute of Chicago and spending time in France, Osver and his wife Ernestine Betsberg (a painter as well) moved to New York. Originally the young couple lived in Manhattan, but as Osver regularly commuted to Queens, he began to perceive an affinity between his native Chicago and Long Island City’s urban visual character, and he and Ernestine relocated there. Osver recalled, “We lived in Long Island City for eight years. They were the most productive years of my life. I’ve never done as much work. And things began to happen. I won a number of prizes. I got a Guggenheim fellowship that was renewed. I eventually ended up with a Prix de Rome [from the American Academy in Rome]…. I left Long Island City, and my life has never been the same since.” In 1960 Osver accepted an offer to teach at Washington University and remained in St. Louis for the rest of his life. When viewing the paintings of this period, the lack of intensity is apparent, but what replaces the brooding, personified structures of his earlier work, is an equally substantive lightness. In the 1955 oil on canvas painting Paestum, the grimacing ventilators which animated Osver’s earlier works are gone. What remains is pure form, but even Osver’s formal and technical approach has changed. Along with narrative, hard edges have disappeared. There is now a matrix of colors and strokes, thoughtful and even tentative, woven together without clear seams. 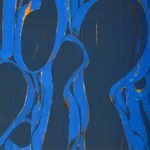 While lightness prevails, there is also a sense of agonizing precision in the painting’s muddy shafts of gold and sparse strokes of cool blue. Paestum is not magic. There is real human drama to the painting’s uncertainty, and Osver’s earlier melancholy, which found expression in his oppressive subjects, narratively, tonally, and symbolically, takes root in his painstaking process. As Osver remembers it, “I began unconsciously to move into a more formal awareness of what was taking place. In other words, if I wasn’t that concerned with capturing the essence of a particular structure, I then would ask myself what was I concerned with. And I began to see more clearly that I was concerned— as I always had been, but I hadn’t seen it as clearly—with the language of form, with color, shape, mass, line, everything that goes to make up the abstract elements of a painting.” Ultimately, the painting stands as a unique record of discovery and hard-earned, reflective success. With the oil on canvas painting Love Garden (1956), Osver’s lines grow stronger and representation begins to slowly creep back in. There is a hint of space created by the leaf-shaped forms Osver piles one atop the other—never enough to give real depth, but enough to tease the presence of a subject. The work transitions from pink to red, and the earlier tentativeness of Paestum gives way to an aggressively determined struggle. Some of Osver’s greatest successes during this period result from a seemingly naked engagement with process, both formally and intellectually. The paintings from his time in Rome, while arriving at a beautifully poised place, seem to scream “damn it!” along the way, as the artist fights to subdue his gift for seeing. The oil painting The Tall Red, from 1959, seems to arrive at a temporary armistice between landscape and pure abstraction, resolving the palpable frustration sensed in Osver’s Rome-period works. The large-scale work immediately strikes the viewer as an aerial view looking down at collection of red-topped buildings. The dark blue that fills the spaces between adds to the illusion of depth. The longer we look, however, the more this perspectival vantage point disappears, and the large shafts of red free themselves from any role in spatial representation. The effect is almost an optical puzzle that brilliantly straddles the line between three and two-dimensionality. In this painting Osver reduces the representation of space to its most basic elements, paring the illusion down to such an extent that seeing is no longer a burden but a choice. In the 1970s Osver would embark on an ambitious project that would help further the reconciliation between his abstract and landscape tendencies. This series of abstract works based on Paris’ Grand Palais highlight the artist’s mental pastiche approach and his longstanding concern with structures. In the oil on canvas Grand Palais 10_70_2 (1970), Osver achieves harmony with an image that has both architectural contour and two-dimensional action. The eye runs up and down the canvas, following lines and getting caught in circular dead ends. The colors shift from red to green and back again, imperceptibly at first. On closer examination the transition is quite abrupt, making Osver’s control of movement and composition all the more impressive. What is most beguiling about the image is its refusal to identify itself as detail or vista. With Grand Palais 10_70_2, Osver’s careful attention to his evolving process, coupled with his ability to draw on a mental cache of images, results in a unique form of abstraction, akin to Cubism freed from perspectival moorings, and set loose in memory. In the 1980s and ’90s, Osver continued to paint intensely, in addition to teaching, and his work continued to develop. In addition to making new paintings, he reworked some of his old industrial-themed canvases in a more abstract way. 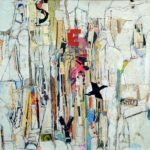 In the ’90s, he added collage to create mixed-media paintings that include elements of Pop imagery and typography. The St. Louis years saw a transition to near-complete abstraction, but in Osver’s late works, motifs from his New York phase return, in new guises.